Two runners for the stable and both in the same race at Caulfield on Sunday. Rhythm To Spare and Radipole run in the last race of the day, the Open Handicap over 1700m with James Winks aboard Radipole and Lachlan King claiming on Rhythm To Spare. It is the second start this preparation for Radipole (pictured), which finished eighth first-up over 1400m at Caulfield on September 1. Mike Moroney elected to stay at home rather than travel to Sydney for the Epsom Handicap from a wide draw however, fared no better with barrier 15 at Caulfield. “I’m very happy with him but he’s got a horror draw,” Moroney said. “It means we will probably have to go back. “Having a look at the speed map it shapes like it will a truly run race so if that plays out then he has a chance to run home. It will be the 10th run this preparation for Rhythm To Spare, who has fared better in the draw and will jump from barrier five. 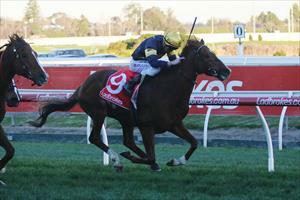 “We’ve claimed to give him a chance and he’s drawn well but it’s a strong race,” Moroney said.